Solutions to enable cost-effective long-distance network transmissions over DSL technology. Moxa’s IEX-402 managed DSL Ethernet extenders provide alternative solutions to enable cost-effective long-distance network transmissions over DSL technology. They benefit from LFP (Link Fault Pass-through), link quality LED for simple onsite troubleshooting and MXview support for easy remote management. IEX-402-SHDSL series provides point-to-point extension over twisted copper. 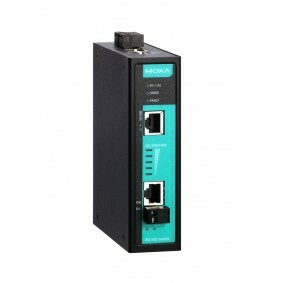 The device supports a data rate of up to 15.3 Mbps and a long transmission distance of up to 8 km. On the other hand, IEX-402-VDSL2 series extends Ethernet signals up to 3 km at 100 Mbps data rate.